WIN one of our new WW2 Nation T-Shirts in our August Giveaway! To celebrate the launch of our WW2 Nation Shop, we are giving away a WW2 Nation T-Shirt to one lucky winner*. Facebook / Instagram: Like and add a Comment on this post, telling us which T-Shirt design is your favourite, or perhaps a design you would like to see from us in the future! We would really appreciate if you could share this post with others or tag someone that you know who similarly shares our passion for history, although this is not an entry requirement for this giveaway. 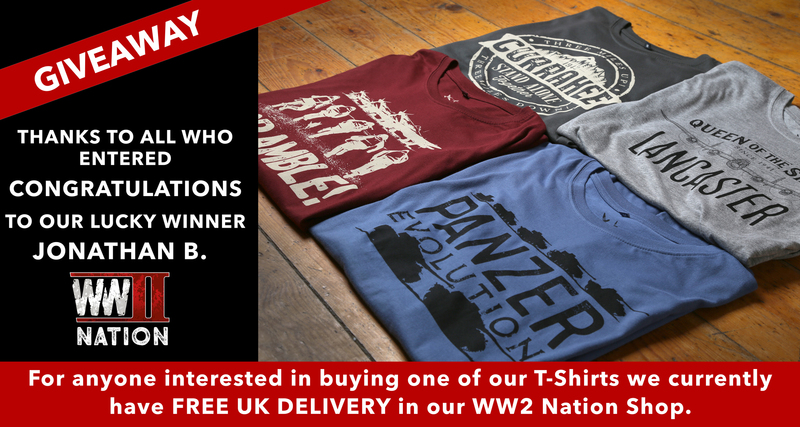 Twitter: Retweet and tag a friend in the comments of the giveaway tweet who similarly shares our passion for history, or you think would like a WW2 Nation T-Shirt. T&C’s: This free prize-draw is open to UK residents only and closes at 11:59 pm on Monday 27th August 2018. The winner will be drawn completely at random, and be contacted shortly thereafter. This promotion is in no way sponsored, endorsed or administered by, or associated with Facebook, Instagram or Twitter. There is 1 prize of a WW2 Nation T-Shirt to be chosen by the winner (*dependent upon Stock Availability at time of choosing). Open to UK residents only, aged 18 and over, excluding employees and relatives of WW2 Nation. Closing date for entries is 11.59pm GMT on Monday 27th August 2018. Facebook / Instagram – like and leave a comment on the Facebook or Instagram giveaway promotional posts telling us either which T-Shirt design is their favourite or a design they would like to see from us in the future – one comment per person. Twitter – retweet and tag a friend in the comments of the Twitter giveaway posts who similarly shares our passion for history, or you think would like a WW2 Nation T-Shirt – one comment per person. The winner will be informed by a reply to their comment plus a direct message within 28 days of the closing date and will need to respond within 28 days or a new winner will be chosen. The winner’s name will be available on request and published on the WW2 Nation social media accounts. The T-Shirt will be posted within 7 days of the winner confirming their address. The promoter is WWII Nation Ltd, Beech House, Compton Fields, Combrook, Warwickshire CV35 9HW. This promotion is in no way sponsored, endorsed or administered by, or associated with, Facebook, Instagram or Twitter. Thank you to everyone who entered our giveaway. Congratulations to our lucky winner – Jonathan Buttigieg! For anyone interested in buying one of our t-shirts we currently have FREE UK DELIVERY in the WW2 Nation Shop.